OLDENBURG, Ind. (CNS) — Ed Kirschner knows there’s one thing he can count on when people visit his small shop where he creates Nativity stables. Before long, the visitors will start sharing stories about Christmases from their past, focusing on memories of the Nativity sets that their parents and grandparents displayed through the years. And while Kirschner prefers listening to other people’s stories, he has his own heartwarming memories to share. Like from his childhood, when he and his mother would make Nativity scenes from boxes and brown paper. His stories also include one of the first wooden Nativity stables he ever made — a Christmas gift for his wife, Joyce, that he gave her shortly after they were married and moved into their first home. Then there’s the Christmas story involving Nativity stables that just may be his favorite. Kirschner shared those stories as he sat in the Creche Shop in the heart of the village of Oldenburg in southeastern Indiana. Some of his handcrafted Nativity stables were on display in an old ice locker that was once part of a general store. In his small workshop, the tools he uses are always close by: a skill saw, a miter saw, a drill, a screwdriver and a box cutter. Figurines of Mary, St. Joseph, the baby Jesus, angels, shepherds and the three Wise Men watch over him. In an interview with The Criterion, newspaper of the Indianapolis Archdiocese, Kirchner said he has been making the stables for about 20 years. He started in his garage when he retired at age 54 from his job as a buyer for a Cincinnati department. For Kirschner, it’s special that he gets to do something that reflects his faith. 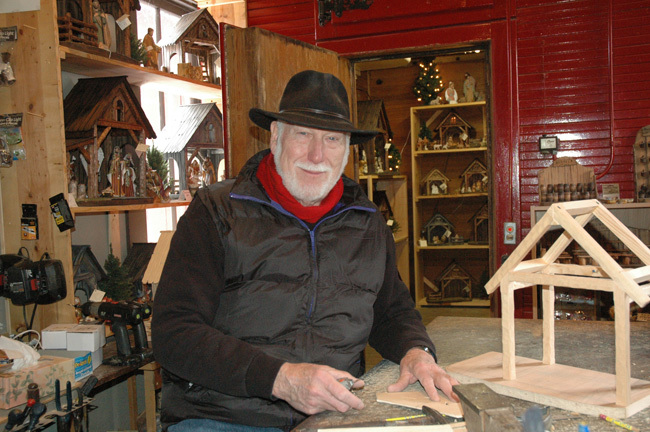 In carving the Nativity stables by hand, Kirschner tries “to make everything look like it was made of hand-hewn logs.” He also adds a cross to each stable. Kirschner also strives to make each Nativity stable different — in a way reflecting the variety of people from across the country and around the world who have stopped by his small shop. Visitors have come from many of the United States, including Alaska and Hawaii. They share their traditions, including how they display the Nativity figures, some handed down from parents and grandparents brought with them when they came to the United States. Other visitors come from Spain, France, Italy, Germany, Canada, Mexico, Ireland and Venezuela. This year, like every year, Kirschner and his wife planned to go to midnight Mass on Christmas. He has gone every year since he was a little boy. “My mother’s faith was yearlong,” he said, remembering the woman who started his love of the Nativity scene. Shaughnessy is assistant editor of The Criterion, newspaper of the Indianapolis Archdiocese.